After having the opportunity to work on one of these pedals – I replaced a broken drive pot and got to mess about with some circuit modifications as well – I immediately decided to buy one for myself. The one I have was a little busted up – the switch needed a good cleaning, and the rubber part of the battery lid/footpedal was long gone. 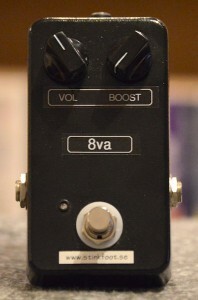 But it sounds really cool… It is more or less a tube screamer, but with an added post distortion mid-boost circuit. I found that with the ”bite” control (er, the mid boost, that is) almost fully off, you get a fairly normal tube screamer sound, but with slightly more gain and less mids than a TS-9. Just the ticket… I did some mods to it – more gain (about 1.5 times) with extended pot range, better low end etc – and it sounds great! I found that I needed to run the ”bright” control fully up to get the right amount of top end, while the ”bite” control hovered around 10 o’clock, for slightly less mids than a TS-9 would have. Yes, a Chinese made cheapo pedal… I recently (april 2013) had the opportunity to test a section of the Mooer Micro series line, and found them to be a little hit-and-miss. Some were good, others downright awful with a few real gems thrown in. The Black Secret is one of the good ’uns (in my opinion). 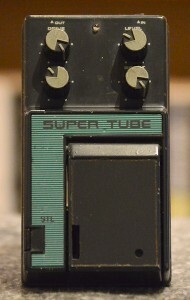 It is basically a circuit copy of a RAT, with an additional switch to select the Turbo RAT mode (LED clipping diodes, for a harder, louder sound). I use it on the ”vintage” setting with the gain around 1 o’clock and the Filter knob fairly high. It sounds really good as a medium/high gain (high gain for me, that is) dirt pedal, and is one of the Mooers I’d definitely recommend. The only thing I don’t like is the splatty compression that sometimes rears its head. It happens when I play hard on the lower strings with the bridge pickup engaged – it’s almost as if the whole pedal gets overwhelmed when the input signal gets too strong. It doesn’t seem to be the clipping diodes that goes ”splat” (it’s the same in the ”turbo” setting, which has LED clippers), but rather the op-amp itself. 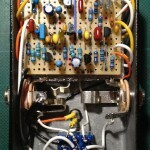 This seems to be a feature of the RAT as well, so I’m not arguing that the Mooer is worse. I just don’t like it, so the pedal stays in storage. Allegedly a clone of the Suhr Riot. I can’t say if that’s true or not, and – if it’s meant to be a clone – how close it is circuit-wise. Personally, I suspect I’ll eventually end up with a Riot sooner or later. 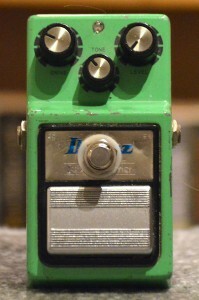 But in the mean time, this is a really good pedal in its own right. Fat and snappy, yet creamy with plenty of sustain and just the right amount of mids and low end. Not too much, not too little (both of which are very common with distortion pedals). The mode switch does make some difference, but it’s quite subtle. The ”Natural” and ”Classic” settings are quite similar – the main difference seems to be that there’s some LED clipping going on in the Classic mode, and also a slight shift in the upper midrange. The ”Tight” setting is indeed a tad… um… tighter. It’s also a hair louder (which might explain why I initially thought it sounded better than the other two). But again, these differences are subtle – which might mean they can come in handy when playing live (when you often need ”just a touch” more or less of something). But it can also mean that it’s only in a live band setting that you can definitely determine which setting works best. I ordered this one from Prymaxe Vintage in the US. I chose the cheapest shipping option, and they arrived in good time right to my mailbox. As I have done with the other Mooer pedals, I’ve added some white-out to the small knobs, to make it easier to read the settings. Newer Mooers already come with this feature, but if you find an older one, it is quite easy to do. After having played many years with the Tube Screamer/Fender amp sound for light overdrive, the Eleven Rack steered me more into the AC30 direction (in that setup, I use a simulated AC30 for my low-gain dirt). And naturally, I wanted to move more towards that tone with my pedalboard setup as well. I looked around, and the Catalinbread CB30 caught my eye. It was part of their ”Foundation” series, where they bring in elements of various classic amps in a stompbox format. They are not modellers, and don’t have any speaker simulation going on – they’re meant to plug into your guitar amp, and make it sound like a Marshall/Hiwatt/Vox/Tweed Fender etc. Look them up at www.catalinbread.com! 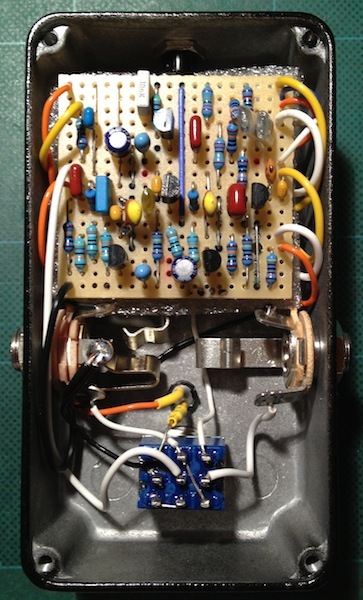 Used as a guinea pig/testbed for a possible new DS-1 mod. I wrote a post about the new DS-1(B) version that has been completely redesigned (check it out here), and wanted to get my hands on one of the more mod-friendly DS-1(A) variants to mess around with. Of course I could have bought a used one, and my local shop also had the regular orange one in stock. But when I could have the 40th Anniversary version, why not?